Premier Li Keqiang’s presence at the annual meeting of the World Economic Forum and visit to Switzerland further promoted bilateral ties to a new level. 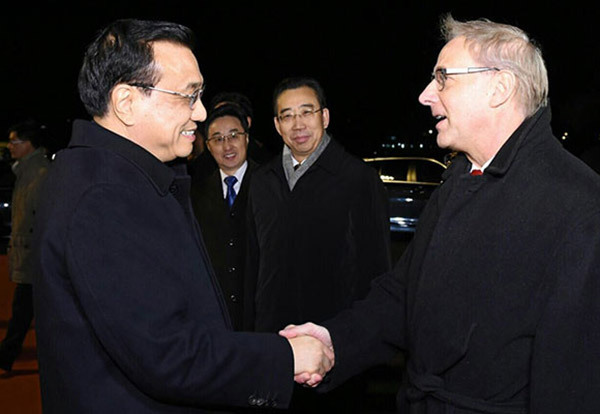 Premier Li Keqiang returned to Beijing on Jan 23 after attending the World Economic Forum annual meeting in Davos - concluding a successful visit to Switzerland. Premier Li Keqiang met with Zhao Houlin, secretary-general of International Telecommunication Union in Zurich, Switzerland, on Jan 22. Premier Li Keqiang met with the World Health Organization Director General Margaret Chan in Zurich, Switzerland. Many renowned experts spoke highly of Chinese innovation, technology, research and creativity at the ongoing World Economic Forum in Davos. Premier Li Keqiang backed China’s declining real estate sector and forecast huge potential for the industry. Premier Li held a dialogue with representatives of the WEF’s International Business Council in Davos, Switzerland. Premier Li Keqiang will attend the World Economic Forum annual meeting in Davos, Switzerland and will also pay a working visit to the country from Jan 20 to 22.